FINALLY, THE IT TZAR TAKES THE BACK SEAT. And as Mr. Bill Gates completes his last full working day by the EOD today - June 27, 2008 - at his Richmond, WA office in the US, an era of Biggest, Richest, and Fastest draws towards a change. Call him Innovator, Software Evangelist, Chief Software Architect, or by any other name, above all, Mr. Gates is a successful businessman, Zero-to-billions kind. And that is how I would want to reckon him, for Mr. Gates is not perhaps a mesmerising orator, neither a charismatic leader, nor a magnanimous personality. Even if he is all of these, they rather remain secondary, for the bottomline is, Mr. Gates knows business, does business and means business. Period. Arguably the world's most famous dropout - and thus perhaps the tallest example that education and money may not have a direct corelation - wrote the first BASIC compiler 17 years ago, and left the legacy as the world's richest man with such words: "There is nobody getting rich writing software that I know of...". On my part, it was a wonderful experience to listen to him from a mere few feet away in Sep 2002 while he was delivering a lecture and providing with his vision (such as, "XML is the future...") at the time of the launch of Windows XP. It being my first encounter with a global leader at close proximity left me with a lasting impression. 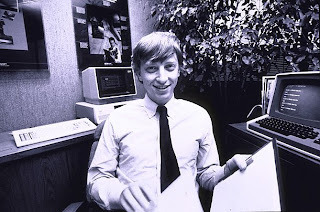 The success of Microsoft Corporation undoubtedly has contributions from many more than Mr. Gates and his "Big Picture" memos alone, but in the world-wide (Globalization?) game of business where media and economy are increasingly tying up, and where winner takes it all, the credit nonetheless has almost always been attributed to Mr. Gates as the poster-boy face of Microsoft. At the same token, the discredit of bad designs, security flaws and sloppy software performance is also to the discredit of Mr. Gates. Mr. Gates opened his keynote of TechEd 2008 last month with the following video. This is where Mr. Gates tries various career changes now that he is to move out of Microsoft. It has been making rounds on YouTube since Jan this year, and it's honest, well choreographed, very humorous and well entertaining. Not worth missing at all! Bill Gates is going to be just fine whatever new avtar he may adorn next. But the industry observers seem to be divided over what would happen to Microsoft in absence of its poster-boy. I recall a media interview a few years ago where the reporter indirectly inquired about the "Google threat". Mr. Gates replied and I quote, "Every couple of years a new company comes up and people say that it would put us [Microsoft] out of business. And every time I say, 'No, not this time'..."
If monopoly and monarchy have anything in common, we should shortly hear, "The King is dead... Long live the King!" Let's see who would stand up and say "No, not this time..." for Microsoft next.